Today I am having to say a sad farewell to such a sweet gal and a very talented designer Darlene. Prior to being chosen for my team, Darlene had made mention to me that she has things in the works that would soon be approaching and that she wasn't sure if she could handle another design team. But I had faith that all would work out and she did too. But unfortunately, as life would have it, she is unable to continue designing for Jo's Scrap Shack due to other prior commitments and has agreed to step down. She was only with us for a short few months but we will miss her! Very talented woman and she definitely is welcome to come back at any time! Thank you Darlene for all you have done in your time on our team! You will be missed my friend! And now with Darlene having stepped down, we do have a DT position open up. If you are interested in filling this position, please send me an email at Joann6274 at gmail dot com. Happy Creating!! Sorry to see you go Darlene, but I understand. I hope you have a wonderful summer. 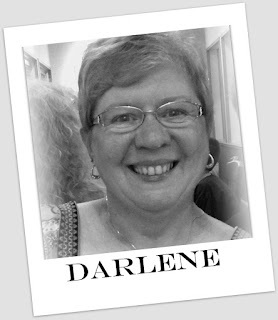 We will miss your beautiful creations Darlene! Wishing you well! Awe thanks so much ladies! I will miss all of you too and hope to come back later in the year! Until then keep doing what you're doing ... this is a fabulous site and design team! HUGS from OHIO!